In wildlife rehab, as in all forms of medicine, there are stories with happy endings and sad endings. 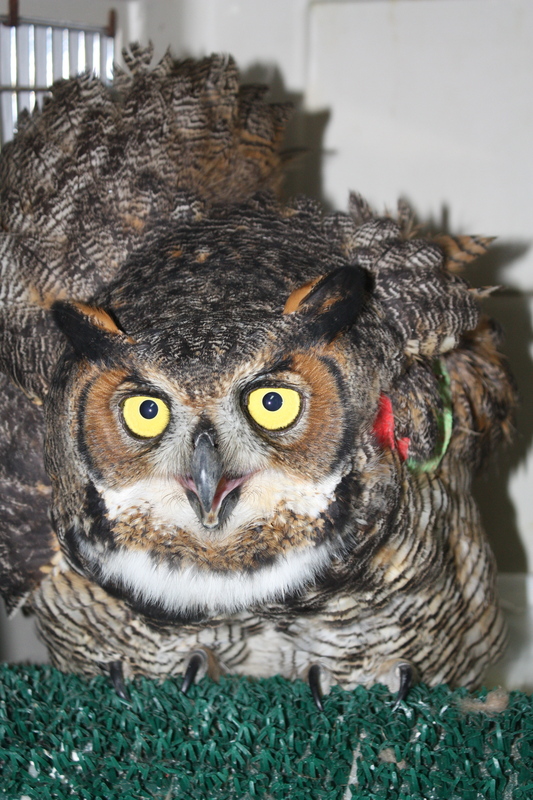 Regretfully, the great horned owl I wrote about last week that had been kept under inhumane conditions turned out to have a sad ending. 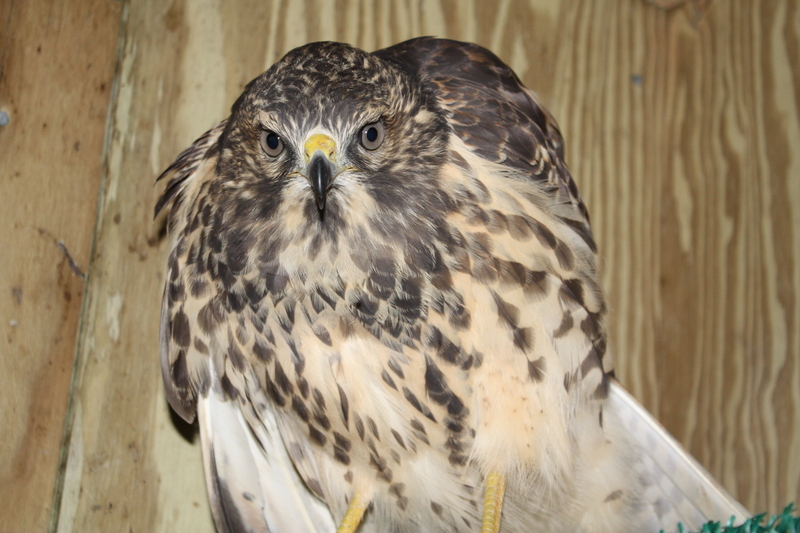 I transferred him to Tri-State Bird Rescue and Research Center in Newark, DE as planned. While there, Dr. Erica Miller, an expert avian veterinarian whose opinion I regard highly, gave him a thorough examination and took further x-rays. She discovered that his injuries were more complicated and serious than we knew. In addition to the fracture of the ulna near the “elbow” joint, the radius bone was luxated (dislocated), and the callus that formed around the fracture of the ulna of the right wing had already caused irreparable damage to the “elbow” joint. Moreover, he had arthritis in both of his “wrist” joints, possibly a consequence of struggling in the confines of his inhumanely small caging. The result was that he would never fly well enough for release, and he would suffer from chronic pain in the joints. Dr. Miller determined that the most humane solution for him would be euthanasia, and this was done. This is always a difficult conclusion to accept, but I feel strongly that it was the right decision. He had already been through too much suffering in the hands of irresponsible humans. It would not have been fair to put him through any more, given that he would never be able to return to the wild. brought to me laying on his back in a shallow box, nearly paralyzed by spinal trauma from hitting a plate glass window in full flight. I placed him on anti-inflammatory and pain medications, and gradually he regained use of his legs and can stand and tear his food to eat. He also regained the use of his wings and can fly, but not well. In the early x-rays, no fractures had been found. But in a recent x-ray, Dr. Miller discovered that, in addition to spinal trauma, Squeak -toy had fractured his right coracoid bone, a sturdy bone that connects the sternum to the shoulder. As a result, the muscles operating his right wing have all retracted. She prescribed some physical therapy exercises, as well as flight exercise, in an effort to re-stretch the muscles so he can extend both wings symmetrically to fly well. The outcome is yet to be determined, but I am hopeful. Meanwhile, back at OMRC, the other great horned owl from last week continues to shred and remove his wing/body wrap, earning him the nickname “Shredder.” Of course he doesn’t like the handling required to rewrap his wing every day. Too bad there is no way to tell him he could save us both the trouble if he would just leave it alone Fortunately for us, we have to undergo this exercise only three more days before the fracture will be healed enough to remove the bandage. You know the cones vets use on dogs and cats post-op? Do they have a owl-sized one? Maybe Shredder could use one of those…best wishes to all and thanks for the update. Good thought! At the very least it might give him something other than the bandage to shred! I’ll have to think about how to design one, or maybe try a cat cone? But it would be for the next Shredder because this guy gets his bandage off tomorrow!